Wright State University prides itself on its use of technology for students to stay connected and engaged in and out of the classroom. We offer a variety of services in and out of the residence halls to connect to campus resources while with us. 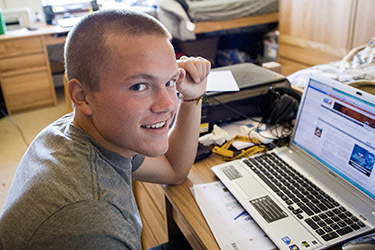 In this section students can learn more about connecting to the University's systems in the residence halls, using telephone and cable services, as well as our Emergency Notification System. Wright State University provides high definition (HD) digital cable television. The system is fully digital and uses Quadrature Amplitude Modulation (QAM) technology. QAM allows cable companies to deliver a digital signal for programming rather than the analog signal used previously. The majority of the channels that students receive are in HD, while a few of the channels are still delivered in SD (standard definition). There is ONE cable outlet per room. Sycamore, Sequoia, and Palms in Forest Lane - the outlet is in the living room. It is strongly recommended that residents discuss TV use and ownership with their roommate(s) prior to arrival. You will need to provide a coaxial cable to connect your television. Every student is provided their own ethernet jack as well as wireless internet in their apartment or residence hall. Learn more about the Wright State Wireless Network. *Note: Network equipment, such as wireless access points, routers and hubs, is not permitted. Campus offices can be reached from off-campus by dialing the prefix 775 and then the extension number. For student telephone billing questions, 775-4200.